When I saw Bad Vilbel four years ago, I immediately fell in love with the "Stadt der Quelle". In Protected content Vilbel will host the Hessentag. I would like to spend some nice hours speaking with you my nice language and bringing my language and culture to the ones who don´t speak Italian or just a little bit, but they want to learn more. And of course eating at a very good and small Italian restaurant and showing you Bad Vilbel along the River Nidda or the forest! Looking forward to seeing you! PS: The restaurant isn´t expensive!! Quando ho visto Bad Vilbel quattro anni fa, me ne sono innamorata subito. Bad Vilbel viene chiamata Stadt der Quelle ed ospitera´l´Hessentag nel Protected content . 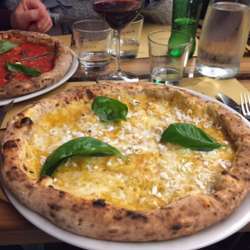 Mi piacerebbe condividere la mia lingua e cultura con voi, mangiando in un piccolo, ma ottimo ristorante italiano. Vi potro´poi mostrare Bad Vilbel, camminado lungo il fiume o nella foresta! Non vedo l´ora di incontrarvi! PS: Il ristorante non e´affatto caro!